Sound-seeker uses the Googlemaps API. Google Maps are not compatible with every web browser. Google Maps currently are supported in recent versions of Firefox/Mozilla, IE 5.5+, Safari 1.2+, and sort of supports Opera. IE 5.0 is not supported. The map is dynamic, interactive and draggable. Since these maps are draggable, you can use your mouse or the directional arrows to pan left, right, up and down to see areas that are hidden offscreen. It's like having a huge map you can scroll around in. You can zoom in, zoom out, or pan in any direction. The map view shows you streets, street names and landmarks, the satellite view gives you access to satellite and aerial images. You can also choose the hybrid view, which superimposes map data over satellite images. To access the sounds of the NYSoundmap, click on the seeker icon located in various locations around the map. A popup window that contains information about the sound and an embedded sound file will open. Click the play button on the bar inside this window to play the sound and pause to stop the sound. Click the x in the upper right corner of the window to close it. Sound files are in .mp3, .aiff, and .wav format, you browser must support these file formats in order to play the sounds. Some of the sound files are quite large and may take a minute to download. Many of the sounds of the NYSoundmap are binaural. 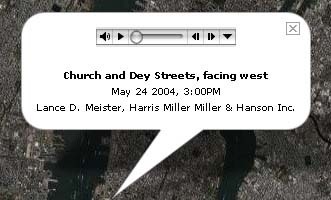 It is recommended that listeners use headphones to have the fullest experience of the NYSoundmap.